We offer professional bulk Document Scanning Bureau Service tailored to your business needs. Every business wishes to move toward a paperless office. But for many, their stacked in-trays and overflowing filing cabinets and archival in boxes… are just too much to handle. That’s why FILEforce offers a professional bulk Document Scanning Bureau Service. We provide value-added services in files migration, files conversion, archiving solution, and external storage facilities. 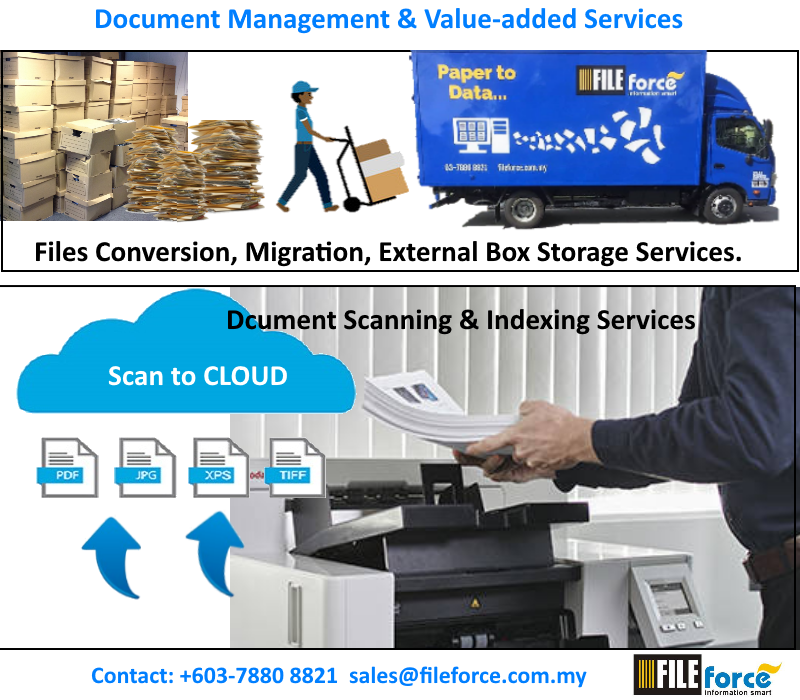 We do Bulk Scanning, Indexing, Classification and send your digital copies to the proper Directory folders and upload directly to the cloud storage. We provide a fast, secure and affordable document scanning service, document storage and secure document destruction. Given the increasing cost of office rents, clients find our space planning services extremely valuable whereby we help them maximize the number of files in any given space through increasing the density of storage. In addition, we help clients with storage of old documents, allowing them to retrieve either the physical copy or upon request, we will digitize and securely email the document, thus, saving them the transportation handling charges. Call FILEforce today for your scanning, destruction and storage needs. Organize your information, simplify your life. SAVE MONEY! reduce printing cost, cut down storage space. EFFICIENCY! access your files anywhere, anytime 24/7.